Finally some actual game play. Last night on G4's E3 coverage they had a pretty lengthy sit down with some of the creators and showed a lot of actual play. If you click on the link above it will take you to the Hope trailer page and on the right there are about 4 or 5 different overviews in the related videos spot. I think it looks pretty good. I still am not sold on the MMO part as I am much more comfortable playing campaigns by myself and online with just some of my close friends. Once you get into the "you have to have a huge party of people to get past this part" or you can't advance then I sorta tune out which is why I never went for WOW. I'm not much for MMOs, but I may like this one, if the price is right (the main reason I say away from MMORPGs). The gameplay vids really remind me of Galaxies. Will be interesting to see what they do to make it different, especially since we're talking like, what....8 years since Galaxies first came out? The 'Hope' video is amazing though. I'm not 100% sold on playing this, though I REALLY want to. I'm not a big fan of MMOs for the same reasons you guys listed. Sounds like Bioware is trying to make it somewhat single-player accessible with the whole 'companions' part of things. We'll see I guess. If I can get my wife to play, then it may not be a big deal. Plus, I know for certain there will be plenty of other friends I know that will be playing too, so hopefully I'll be able to join up with them. Everything I've seen is that is pretty single player accessable. Yeah, some quests are going to need a party, and you need to do some of the interactive stuff to get the best rewards, but it still sounds very loner friendly. Well I could always party up with everyone here that plays and on Bloo! They have confirmed one thing I was hoping for: Red Sith playable species. With face tentacles. so who all is still in for playing SWTOR? Myself and a bunch of others who have dropped warcraft or just want to play have it on lockdown hehe. Just waiting for that release date and more info so we all play on the same server. We've been coming up with Guild concepts as well in anticipation. I'm still looking forward to it. I'm liking what I'm seeing in terms of story, Advance Classes, companions, and PVP. This is going to be my first MMO, so much of what people are talking about I don't have experience with. I'm extremely eager to see all the races for each class. Well its certainly going to be less traditional because of the companions as well as having them do the professions for you, otherwise it looks in league with most mmo's. the first time playing an mmo is usually the best time. its never a been there seen that, but always brand new experience so you're lucky for that. 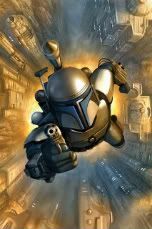 week long beta to test the Bounty Hunter and Imp Agent to level 15.
got the BH to 11 and so far its excellent. very smooth gameplay, feels a lot like KOTOR tied right in with mass effect for sure. the questing and story are very well done. Not sure what else to say unless anyone has questions. Looks like it's still going to be awhile. The article says fiscal 2012, so after April, 2011 at least. Sigh.... Heck the 2nd book for this game comes out in Feb LOL, at this rate they'll have a complete anthology of novels out by the time this game is released. The first book was AWESOME though, I'll give them that. Yeah, that's what seems to have been going around. Still, I hope for an April-June release. The first book was AWESOME though, I'll give them that. I had heard it was so-so. something about a particular action scene taking up too many chapters or portion of the book, but mostly the realatively dry writing. to be honest you are the first I've seen say it was great. I was waiting to pick it up as a paperback hehe. No room on my bookshelf for Hardcovers anymore. Actually I listen to audio books on my Iphone from audible.com (It's something I can do while driving) That action scene to me was one of the best parts for me IMHO. It really took me back to what I loved about Jedi when the 3 battles are all going on at the same time. I thought is was great. 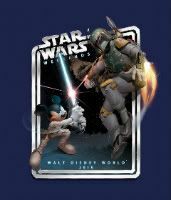 The other thing I liked was that it was all new characters in the SW universe. I mean, right now I am going through The New Jedi Order series, which I am also liking alot, but I am getting sick of all the chapters dealing with Luke, Leia, and Han. I mean cmon already they had their glory, the parts on the new characters is way more exciting to me. So, anyway I loved the book and am really looking forward to the next one in Feb. Missed this one...I think...whats the name of aforementioned book? The amazon listing is pretty cool cause you can check out some of the pages before you buy. Very nice. You can also listen to a little bit at audible.com as well. It says right on cover it is based on the video game, so we'll see I guess. Ok I got that one. Just didnt realize it was tied into the game. Yeah I hear you on the NJO books. I had messed up when they were newer and read the second one first and then none after.. I was mostly confused as to what was going on. Giving them another chance now and greatly enjoying them. 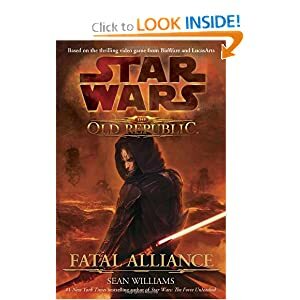 I wouldn't doubt there will be mention of events from the book within SWTOR when its released but it's pretty much just using the setting to tell a story. typical tie in stuff. I used to play world of warcraft once upon a time. books based in that world had little to do with the games. characters or mention of events would pop up.. but in general nothing ever directly. I must admit though, seeing book characters in the game was cool though, it caused them to mean more if you had read the book, vs. just running into them some time.